maintenance, and renovations to the residential community. 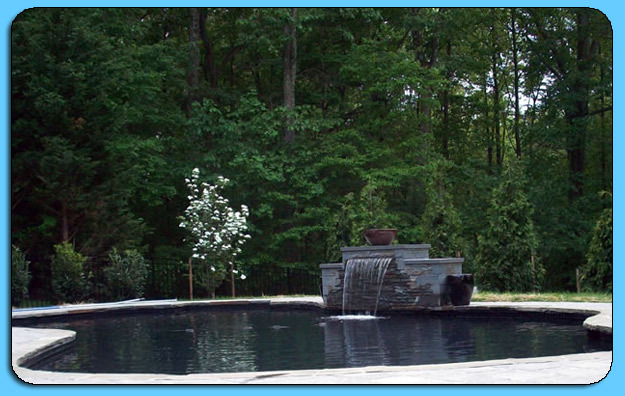 FREE ESTIMATES - A Watermark representative will consult with you poolside to determine your needs. PROFESSIONAL WORKMANSHIP - Our work carries a two year warranty on all parts and labor. FULL RENOVATION - This normally consists of new tile, new stone or brick on the coping, and a new pool interior. PARTIAL RENOVATION - A new pool interior or new tile and coping. GENERAL REPAIRS - We replace the damaged existing coping stone/brick and or perimeter tiles. LEAK DETECTION - With diagonostic testing and/or video pipe inspections, we can determine where the leak is located and make the repair. CAULKING - Perimeter caulking is your first line of defense against an untimely deterioration of the pool structure. SKIMMER REPLACEMENTS - We handle all types of plumbing repairs for your filter system. Need the spa larger or alterations to your steps? FIBER OPTICS - Enter the exciting world of multi colored lights in and around your swimming pool. AGGREGATE FINISHES - Explore the new colorful and more durable pool interior finishes. For more images of our work, visit our gallery. The pool in the image below features a beautiful fountain.